Author/Illustrator Paula Wallace Presents a New PB: Mr. Reginald and the Bunnies + a Chance to Win a Copy. Today it is my pleasure to interview children’s picture book author/illustrator PAULA WALLACE who just released a new picture titled MR. REGINALD AND THE BUNNIES. Paula tells where the idea for this delightful story came from and how she illustrated it. My review of the story will follow and then you will have an opportunity to enter a drawing to win a copy . Mr. Reginald and the Bunnies evolved from a series of paintings created after an artist residency at the Heartland Family Service Therapeutic School in Council Bluffs, Iowa. The school was established for children unsuccessful in a conventional school setting and my residency was supported by WhyArts, an arts organization whose service is dedicated to those on the margins, the under-served, and those with disabilities. The kids and the teaching/support staff provided a wealth of opportunity to observe and fully appreciate the challenges and energy and love required to serve children (ages 5-20) who carried so much trouble with them. Of course, I also observed other children in my family or my friends’ or at church – there’s the remarkable universality of movement and curiosity and testing of boundaries. Yet teachers, moms and dads, caregivers of every stripe need a break – and so do children. In Mr. Reginald & the Bunnies we see that everyone is looking for a little respite, a little change. We also see that sometimes all our planning and great expectations can be upended and, as a result, we have to roll with it. All of the paintings are oil on panel. Because I also do fine art painting for galleries, oil is the tool I know. I can move from one painting to another as they dry enough for me to take them to the next level. Needless to say, there were rabbits everywhere while working on the book. Anna Olswanger, my agent, really put me through the paces to fine tune everything. She could look at work objectively and honestly – something very important to artists and writers who are often too close to their work. Making changes, stretching and pulling the work, even hearing “no,” can be daunting and humbling and deflating. Yet there is a grace in all of that sweat, an appreciation for doing your best to give it your best. After all, the story and the pictures are not something to hoard and hide, they’re meant to be shared, making all the work so much sweeter. By the way, I learned that Foreward Reviews named Mr. Reginald & the Bunnies among the finalists in the picture book/early reader category! Darlene’s Review: Mr. Reginald the rabbit and his neighbor Mrs. Paddock live in a quiet neighborhood where they pride themselves for the orderly lives they lead. They like everything to be tidy and “just so”. This order is disrupted when Mr. Reginald gets a visit from his three rambunctious nieces and nephews. Get ready for a sweet and delightful romp with an old-fashioned, homey feel reminiscent of Peter Rabbit. The soft, colorful illustrations add whimsy and humor to the playful and energetic antics of the rabbits. Snuggle up and put on your bunny slippers. This has the makings of a favorite read-aloud bedtime story for the youngest readers. To enter and win a copy of MR. REGINALD AND THE BUNNIES, leave a comment on this post. I will put your name in a hat and one winner will be chosen at random from all who entered. If you share this post on FB or Tweet it, let me know and I will add your name again. The winner will be announced on this blog on Thursday, April 11, 2019. Artist and author, Paula Wallace, has a studio in the Hot Shops Art Center in Omaha, Nebraska. Wallace, a graduate of the University of Iowa, recalls a professor saying “the artist’s job is to pay attention.” Her art and stories are informed by her work with children and other under-served communities, as well as the urban and rural landscapes in which we dwell. Wallace has illustrated for other authors, as well as writing and illustrating her own books, including Choose Your Days (Cinco Puntos Press) and Mr. Reginald and the Bunnies (Pomegranate.) In 2018, Choose Your Days represented Nebraska at the National Book Festival in Washington, D.C. Her work as a fine artist includes many gallery exhibits in the United States and Italy. Her work is held in private collections throughout the United States and internationally. PB Author Laurie Wallmark Presents:Hedy Lamarr’s Double Life. Best-selling Non-fiction PB Author of ADA BYRON LOVELACE AND THE THINKING MACHINE (Creston books), and GRACE HOPPER: QUEEN OF COMPUTER CODE (Sterling) has a new book about one of the most glamorous women from WWII era Hollywood, Hedy Lamarr. LAURIE WALLMARK’S new book explores the brains behind the beauty of one of Hollywood’s most popular leading ladies. Writing Reviews For Beloved Books:How Did I Do? Are You Up For the Challenge? I am happy to say that I posted EIGHTEEN REVIEWS for PB, MG , and YA books and even gifted three of them in contest give-aways. Here is the list of titles I reviewed – in no particular order – all of them amazing reads and worthy of recognition. I read more than FIFTY books, but managed to write reviews on the above 18. I hope to do better this year and spread the word about great books, and under-represented authors. Care to join me? Next time you read a book that you love, let the author know in the best way possible: write a few sentences telling him or her what you enjoyed about the story, and share it on Goodreads or Amazon. Take it from me, it will make a writer’s day and let other readers know about great books. Happy Reading and reviewing. May 2019 be a great year! 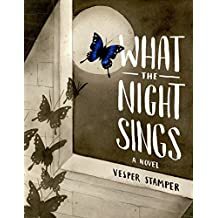 WHAT THE NIGHT SINGS by Vesper Stamper is an exquisitely told tale of despair, hope, love and how music has the power to heal even the most damaged souls. I knew this would be an amazing book from the moment I held it in my hands. The weight of it, the thickness of each page, the light and shadow of each illustration reinforced my assumption that this was a story to be reckoned with. A force that should not be denied. A serious tale that will imprint itself into the psyche, like the horrific numbers branded onto the arms of holocaust survivors. Gerta is a survivor of the death camps and lived through the horror of watching so many loved ones, including her beloved Papa, die. Singing meant everything to her – before. Before the rounding up, before the detainment, before the concentration camps. When liberation finally came, Gerta lost her voice and had to be content with playing her Papa’s viola. Alone, with her whole life in front of her, how can Gerta find her place, her peace, her voice and maybe even love in this uncertain world? This story will stay with you long after you turn the final page. 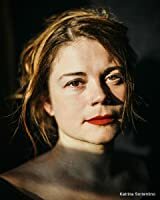 Vesper Stamper was born in Nuremberg, Germany and raised in New York City. Her family was an eclectic mix of engineers, musicians and artists who didn’t think Voltaire too tough for bedtime reading, Chopin Valses too loud for wake-up calls, or precision slide rules too fragile as playthings. She married filmmaker Ben Stamper right out of college, and together they have two wildly creative children. When Vesper earned her MFA in Illustration from School of Visual Arts, Ben gave her an orange tree. She illustrates and writes under its leaves and blossoms at her grandfather’s old drafting table, in the pine woods of the Northeast. YA Author Joshua David Bellin’s New Book: ECOSYSTEM Blog Tour. Details on how to enter the drawing for a copy of ECOSYSTEM are at the end of the post. Tasty Colors in SCOOP THE ICE CREAM TRUCK by Patricia Keeler + Give-Away. SCOOP is about a retro ice cream truck. For lots of summers, children came running to buy his small vanilla cones. But now, Scoop is having a hard time competing with the new ice cream trucks that sell fancy flavors like rum-raisin and bubblegum. They even have new types of ice cream like dots and flash frozen. For the art in SCOOP, I wanted to highlight the original flavors of ice cream—to give the art a taste of the retro colors in ice cream flavors like vanilla, chocolate and strawberry. Spunky’s red ball suggests a cherry. Here is the mint-flavored page! I think of this spread as being minty-fresh. This is the moment when Scoop meets Spunky and his life is soon to be refreshed. Here is the creamsicle page— orange on the outside, and vanilla inside. Getting to play with a joyful little girl after all his years of working is like a dream come true for Scoop. There is chocolate fudge sauce running down, when Scoop’s world comes apart. Scoop is in a sticky situation. At one point Scoop transforms himself into a ‘cool’ truck with neon cones that zoom around. First, I created a watercolor explosion of ice cream flavors — lemon, cherry and raspberry. Then I used Photoshop to apply this watercolor explosion to the big new cones on Scoop’s roof. On the final page spread, when Scoop and Spunky get to the mountains, I dropped this same watercolor explosion into the trees. The fall trees become brilliant with ice cream colors. Then I placed the cherry on top! Here is a SCOOP seek-and-find for you! One of my favorite pages is the coffee-flavored page. There is a pattern on the coffee page that gives it away! Can you find it? Enter to win the fabulous prize package above: A copy of SCOOP, a Scoop framed sketch and pin. Leave a comment on this post and your name will be entered in the random drawing. Share on FB or Twitter or reblog the post and you’ll get another chance to win. One winner will be announced here on WEDNESDAY, 4-25-18. Patricia Keeler is the author-illustrator of SCOOP THE ICE CREAM TRUCK and LIZZIE AND LOU SEAL, both published by Sky Pony Press. She is the Christopher Award winner for her illustrations in WOULD YOU STILL LOVE ME IF and first place winner of New York Book Festival. Thank you for inviting me to your blog today, Darlene. I’m delighted to tell you about 7 KEYS TO RESEARCH FOR SUCCESSFUL WRITING! published October, 2017. What motivated you to write the book (a break away from your usual poetry)? Kids ask authors, “How long does it take to write a book?” A variation is, “How many books can you write in a day?” When I explain that I must first learn about my subject before I can write about it, many look surprised. When I tell them I often spend as much time getting ready to write as I do writing, they look amazed. Kids in school aren’t accustomed to spending much time investigating what they are going to write about. My writing partner for 7 KEYS TO RESEARCH FOR SUCCESSFUL WRITING is Mary Jo Fresch, Professor Emerita and Academy Professor of The Ohio State University. Prior to becoming an educator of pre-service and in-service teachers of Kindergarten to Grade 8 teachers, Mary Jo was a classroom teacher. Together we have seen far too many writing-before-ready results. They are usually dismal at best and at worst convince students that writing is too hard and mysterious and not for them. The goal of our collaboration is to provide classroom teachers with a practical resource to help them demonstrate that writers don’t just pick up and a pen or sit down at the keyboard and start writing. What was the collaboration like? This is our sixth book together. Prior to 7 KEYS, we wrote a series of five titles called LEARNING THROUGH POETRY, each dealing with different aspect of sounds: consonants, vowels, blends, digraphs, and rimes. We come from different backgrounds but share much in common, including work ethic and goals, so we make a compatible team. Before and during a new project we discuss ideas by email and conference via SKYPE. Once we establish a direction and general outline we agree on our respective responsibilities and jump in. In this case we decided to use my 50-year experience to demonstrate how writers prepare to write and Mary Jo’s deep knowledge of classroom and scholarly research to provide meaningful follow up activities. We adopted a word not used much — presearch – to show how writers get ready to get ready before they write that first word. That gave us shape and direction. The result falls into seven categories, or keys, which are important elements that lead to good writing. Things you learned doing your own research for the book. The first thing we learned was that nearly all books we could find that are meant to help young writers focus on the process of writing and how to improve it. We decided early on that teachers might not need yet another book about the act of writing. What they do need is a book about the act of getting ready to write, the kind of thoughtful, organized preparation that leads to good writing. Except for a page here, a chapter there, we didn’t see a lot of help out there. The challenge was to find ways to make “doing your homework” seem necessary, fun, and un-daunting. My solution was to show by example what I do, and Mary Jo created imaginative and practical activities that children can relate to. This also gave me a chance to introduce two segments, one directed to teachers and one to kids. The ones to teachers are a cross between mini-PD sessions and personal asides meant to provide insight into the KEY in that chapter. Those meant for students are like a quick author’s visit that can be read as often as wished. They, too, set the stage for Mary Jo’s creative activities. Please let your readers know how one of them can win a free copy of 7 KEYS TO RESEARCH FOR SUCCESSFUL WRITING. We say the grade range is 3 and up but a university president recently told me he thinks more than a few freshmen could benefit from it. We hope readers will enjoy our book and feel free to leave their comments on Amazon.com. Mary Jo and I will present a 2-hour workshop on the subject in July at ILA in Austin. Maybe we’ll see some new friends there. David is the prolific children’s poet and author of 100 titles. His books have received more than 50 honors, including Best Children’s Nonfiction Book of 2016 by Society of Midland Authors. He has been translated into twelve languages, anthologized in nearly 200 books, and appeared in dozens of magazines and interviews in print and online. Among other professional books are Easy Poetry Lessons that Dazzle and Delight with Bernice Cullinan and Rhymes for the Times, Literacy Strategies through Social Studies with Tim Rasinski. Professional articles have appeared in Dragon Lode, Reading and Writing Quarterly, The Reading Teacher, New England Reading Association Journal, and others. David is trained in research, holds two degrees in science and two honorary doctorates in letters. He has performed 300 times across the country and abroad in conferences, schools, and workshops. He is Drury University’s Poet Laureate. Mary Jo is Professor Emerita and an Academy Professor of The Ohio State University. After years as a classroom teacher, She became an educator of pre-service and in-service teachers of Kindergarten to Grade 8 teachers. She speaks nationally and internationally about literacy-related topics and researches the developmental aspect of literacy learning. Her articles have appeared in peer reviewed journals, such as the Language Arts; Journal of Literacy Research; Reading and Writing Quarterly; Reading Psychology; The Reading Teacher; Journal of Just and Caring Education; and Journal of Children’s Literature. She has authored/co-authored 19 books for teachers, including The Power of Picture Books (NCTE), Strategies for Effective Balanced Literacy (Shell Education); Engaging Minds in the English Language Arts Classrooms: The Surprising Power of Joy (ASCD) and Learning Through Poetry (Shell Education). To have your name entered in the random drawing for a signed copy of 7 Keys to Research For Successful Writing, leave a comment below stating you will happily write a review of the book on Amazon/Goodreads. Darlene will add your name to the list and ONE winner will be chosen and announced her on Wednesday, March 7, 2018.